Earlier this year the Dow Jones Industrial Average rose on 20 consecutive Tuesdays – an unprecedented streak since records began. 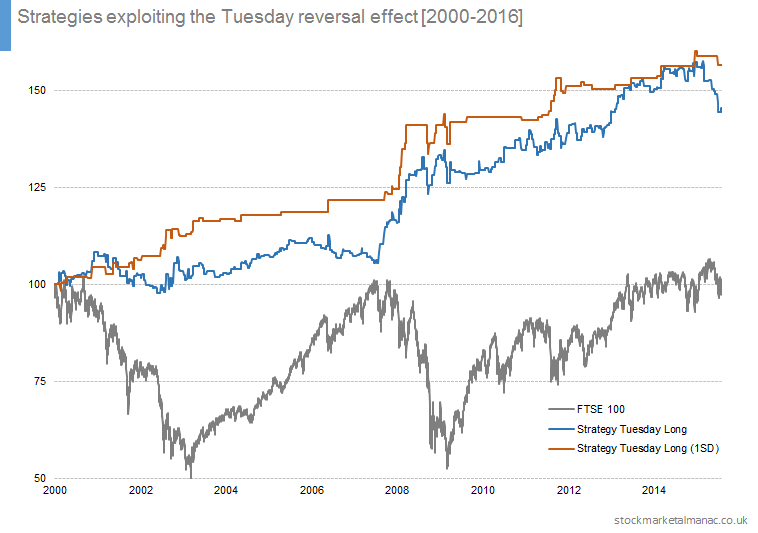 A little earlier in the year the FTSE 100 Index rose for 10 consecutive Fridays. Not as remarkable as the Dow streak perhaps, but still impressive. 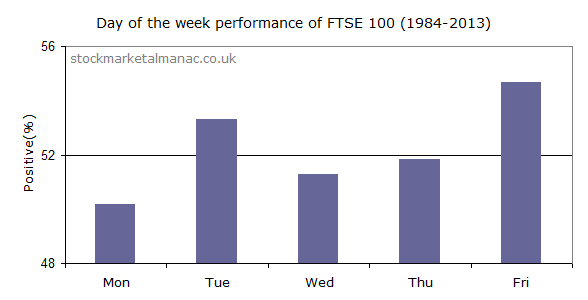 The following chart shows the average positive returns for the FTSE 100 Index for the five days of the trading week since the index was started in 1984. Since the 1984 the strongest day of the week has been Friday; the FTSE 100 Index has had a positive return on 55% of all Fridays. 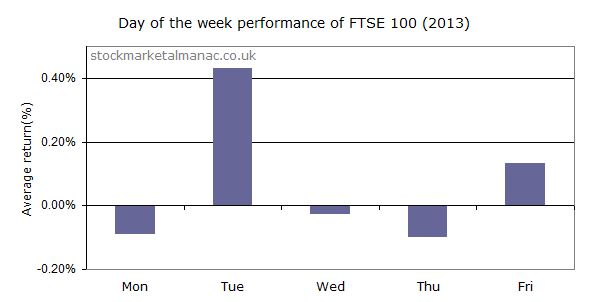 The weakest day has been Monday, the FTSE 100 Index has had a positive return on 50% of Mondays. For comparison, the following chart shows the same data but just for the period of the first six months of 2013. The relative strengths of the days for the first half of 2013 is similar to that since 1984; for example, Monday is still the weakest day. However, Tuesday has overtaken Friday as the strongest day of the weak; the market has risen 69% of all Tuesdays in 1H 2013. 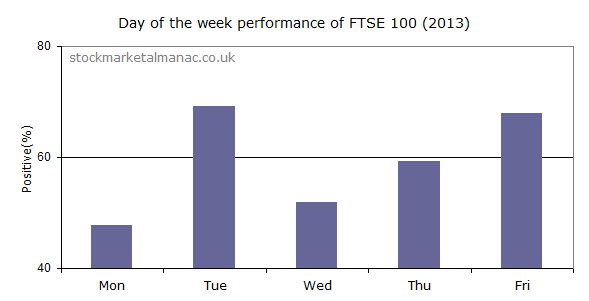 The strength of Tuesday in 1H 2013 can be seen even more in the following chart which plots the average return of the FTSE 100 Index on the five trading days of the week. In 1H 2013 the average index return for Tuesday was 0.4%, compared with just 0.13% for Friday (and negative for all other days of the week). 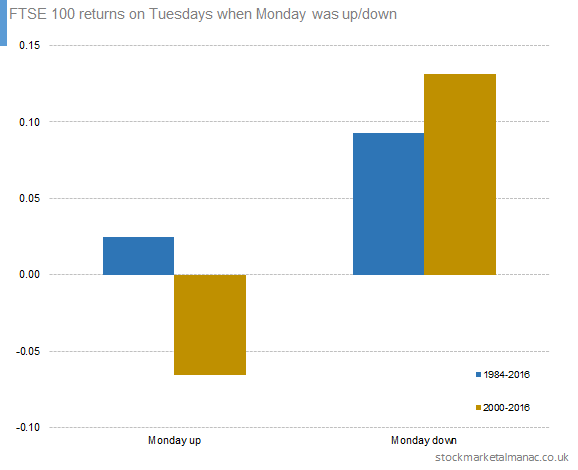 Some traders believe that Tuesday’s market reverses Monday’s. In other words, if the market rises on Monday it will fall the following day, and vice versa. Tuesdays when market has fallen the previous day (Monday down). The data analysed covers two periods: 1984–2012 and 2000–2012. 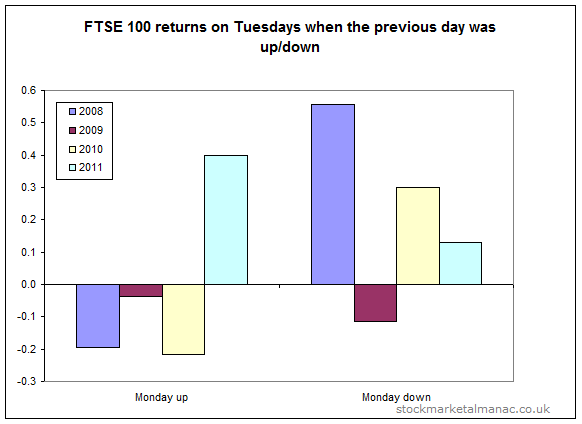 For example, in the period 1984-2012, the market rose on average 0.02% on Tuesdays following a Monday increase. 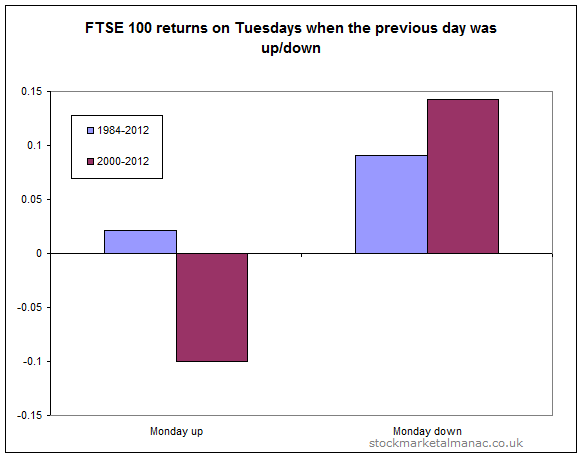 As can be seen, for the longer period of 1984-2012 the theory that Tuesday reverses Monday does not seem to hold. For this period, when the market falls on Monday the return is positive the next day (which is fine), but when the market rises on Monday, average Tuesday returns are positive as well (i.e. no reversal). However, since 2000 the theory appears to be working rather well. 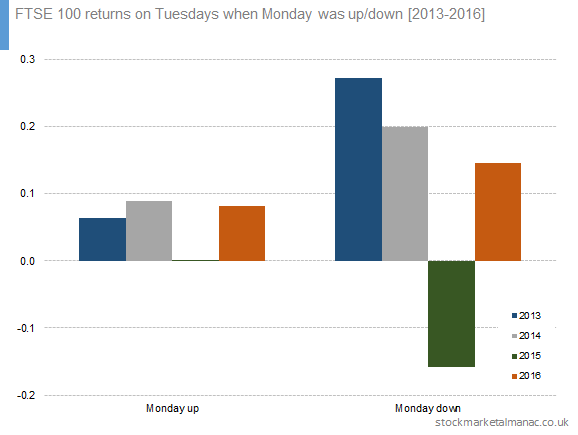 Tuesday returns have on average been the reverse of Monday. 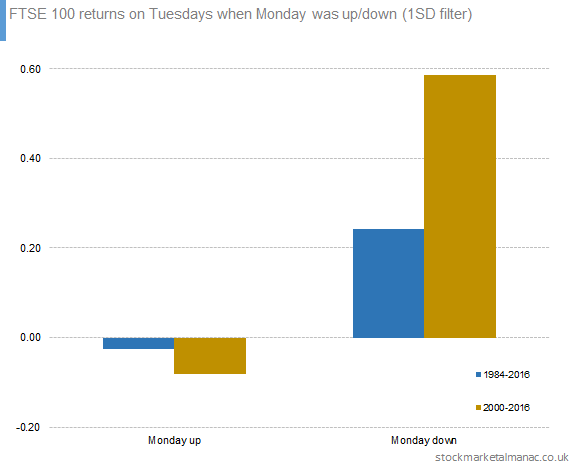 In fact, when the market is down on Monday, the average returns the following day have been five times greater than the average returns on all days since 2000. 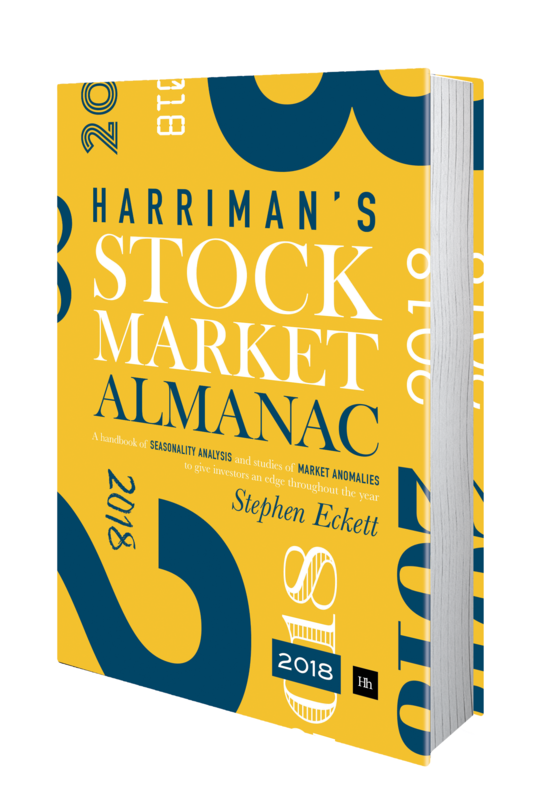 By 2012 the market portfolio (portfolio 1) value would be 82, portfolio 2 would be worth 148 and portfolio 3 would be worth 196. It’s interesting to observe that both portfolios 2 and 3 performed well during the steep market fall in 2007-08. Although of late the profitability of portfolio 3 has been falling. The chart below looks at the effectiveness of the theory on a year-by-year basis for the period 2008-11. It can be seen that while the theory worked well in years 2008 and 2010, it did not do so well in 2009 and 2011. 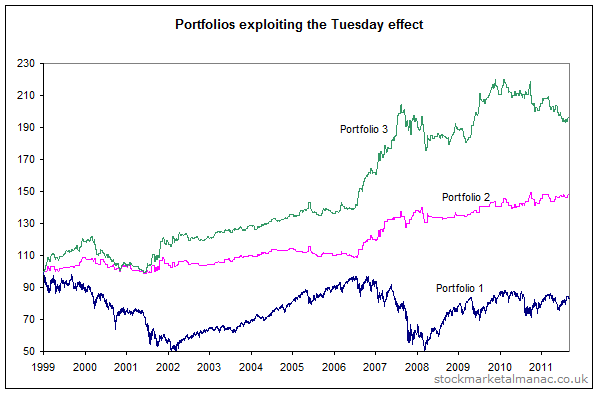 The difference in profitability of portfolios 2 and 3 in 2011 is attributable to the market rising (relatively) strongly on Tuesdays following a positive Monday.